We carved pumpkins with the boys this past October. It’s an annual tradition. We don’t do scary, but do fun. And the boys (including me) have fun carving pumpkins. So, we sat on the grass lining our entryway to the front door of the house, and we carved pumpkins. We did it there because there is an outlet on the outdoor lamp… and we take our carving seriously… like Dremel tool seriously. I cut the top openings and pull them back to reveal the inner goop. The boys scoop out all the goop and seeds to clean out the pumpkins so that we can put tealight candles down inside them. After the significant clean-out process, I draw the design on each pumpkin with a sharpie marker and carefully supervise as the boys do the big cuts. I handle the finer cuts and begin the dremeling process to add depth to the designs. And once I get the edges taken care of, they do the broader dremeling. For the record, the pumpkins turned out pretty decent… if I must say so myself. Now for those who don’t know, there is a lot of stringy goop and plenty of seeds in each pumpkin. We try to get most of it into an old plastic shopping sack so that it doesn’t leave our entryway looking nasty for a month. But sometimes we miss some seeds and goop. Usually, the birds take care of anything we leave behind. And we leave two neatly carved pumpkins sitting on the front porch area for fall time… or as long as the pumpkins can last without getting gross. I haven’t thought about those carved pumpkins and all their seeds since we threw their molded, rotting remains away some time in November. We picked them up, and threw them in the trash. Well, most of them. One of them did bust out the bottom from decay. And then the boys decided it would be fun to smash pumpkins. (They have no idea about the band or the headless horseman.) After their fun out away from the house, we collected all the mess we had made… at least most of it… and put it in the trash. Out of sight, out of mind. Till yesterday. I came home from preaching at a church a couple hours from home to all kinds of fun PR31 and da boyz had cooked up. And one of the surprises they had for me was two pumpkin plants now growing in our yard. That’s right. Not in the garden area, where we had intentionally planted pumpkins. No, one in the grass near the entryway to the front door of the house… and one out by the driveway where we had smashed rotted pumpkins. Sure glad it was pumpkins and not poison ivy! I don’t know if the pumpkin plants will survive all this weird weather we’re having and produce pumpkins. I don’t know if we will transplant them or leave them where they are for a fun reminder. What I DO know is that I had no idea we were planting pumpkins last fall. We were just going about life, doing what we do. We didn’t think we had planted any seeds. In fact, we probably thought we picked them all up. Or that anything left was so rotted that it couldn’t possibly survive. 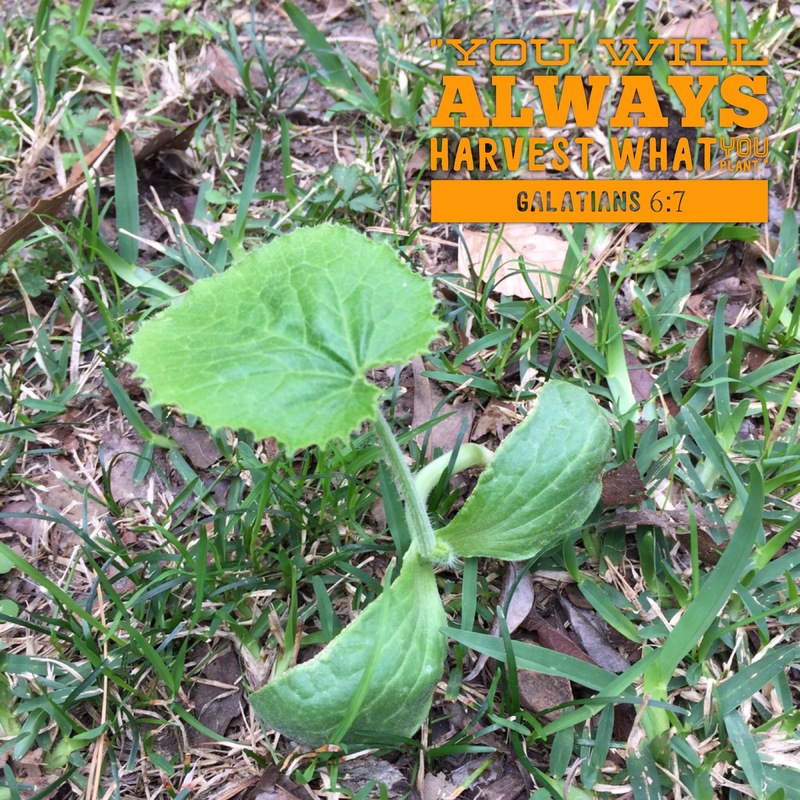 But we certainly planted some pumpkin seeds… and now they are producing plants which could possibly produce more pumpkins. The same is true in each of our lives. We are each planting seeds of whatever we are wherever we go. Paul told the folks in the church at Galatia, “You will always harvest what you plant.” And sometimes, we don’t even realize that we are planting. Some of what we produce sprouts, breaks the topsoil, buds, blossoms, and produces fruit without us even knowing we had deposited anything there. This is why it is crucial that we make sure our life is full of goodness and godliness. Because what we plant is ALWAYS going to be what we harvest… whether we know we planted it or not. So, let’s make sure what we have inside us to plant in the lives of others is exactly what we would want to pull off the vine once it has grown and developed. Additionally, we don’t always see what we are planting which we will receive in eternity after we have passed from this earth. I suspect there will be some unexpected harvests for each of us then as well. That really motivates me to plant good stuff at every turn. I don’t know if our little unexpected pumpkin plants will make it or not. I do hope they survive and produce… Wouldn’t it be fun to pluck fresh pumpkins off the vine at the very spot where they need to be carved this next fall?